Be the smoking master with the iGrill Pro Ambient Probe. Simply set the minimum and maximum temperatures and the In-App alert feature will send an alert if your smoker gets too hot or cold so you know the food you are smoking is going to come out just right. Includes 1 iGrill Pro Ambient Temperature stainless steel probe, 1 probe wrap and 4 colored probe indicators. For use with iGrill temperature gauges. I bought this after watching reviews online. it seemed to make sense to get the temp reading off the grill elevation opposed to the top of the kettle. (Which is where Weber places it) My indirect cooking has been made much easier to maintain consistent heat. My BBQ has been great all summer with out the worry of burning or undercooking. Love it makes long cooks easy.you can go inside in AC and just monitor your food on your phone. I initialing used this for outdoor grilling, the remote app on iPhone is great for keeping track of temp. The best news is I have found it to be very useful as a remote sensor to track the temp in our outdoor sauna. Just start the wood fire and do as you wish until the temp reaches target. No more continually checking if the sauna is ready, very handy. I bought this to monitor my Weber Smoker, and Performer, but have also used in in monitoring oven temperatures for Christmas cookie, and bread baking. Absolutely love it!!! It works as advertised. Use it primarily for thick steaks and pork tenderloin. I purchased two of these one for myself and one for my son. We are both very pleased with our product and would recommend to all who cook and use the Igrill. It gives a truer reading than the thermometer on my grills. I find that my smoker is off anywhere from 10 to 20 degrees so a big help there. And like I always like to say. 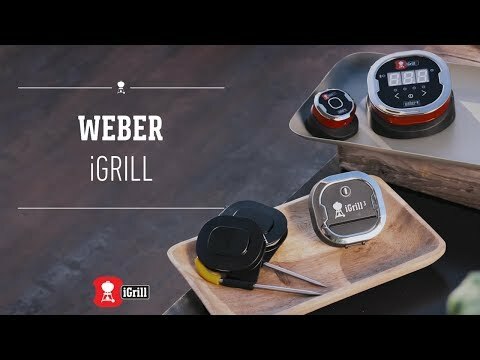 If you are not cooking with Weber you aren't cooking.